Ultra8 is a Chip-8 interpreter, with some games included. Chip-8 is a virtual machine created in the 70s to run on home computers based on the RCA1802 CPU. The Chip-8 instruction set includes math operations, basic graphics commands, timers, and a way to make sound. For more information about Chip-8, check out the Chip-8 Wikipedia page. Ultra8 contains full support for the base Chip-8 instruction set and functionality. Support for the "SuperChip" instruction set (increased resolution, screen scrolling) is partially implemented, and in progress. *Lots of included sample programs. 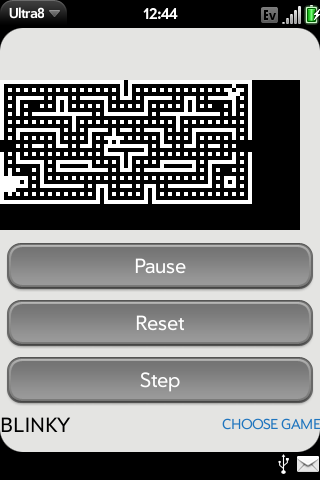 *An on-board assembler to allow users to write programs for Chip8 right on the Palm Pre. *A way to download Chip8 code from external sources.